Skrevet av Ingy, 9. september 2011 12. januar 2015 . I’m sitting on the subway, thinking «will I miss this when we move?» Will I miss being part of the multiculturalism of Oslo east? Will I be sitting in white suburban Asker, missing the diversity of the city, like I missed NYC sitting at Northwestern College, St. Paul, Minnesota? Many people claim multiculturalism is impossible. They’re afraid of Eurabia – that Islam will conquer Christianity in Europe due to immigration. They’re focusing on what’s not working, leaving a blind eye to the positive side of multiculturalism. They’re afraid of everything and everyone they see as foreign, strange, and different. They start hating. One of them attacked Norway on July 22nd. He did it to get publicity. He killed 77 people and wounded even more, to make a statement, to force us to see his statement. I’m not going to mention his name, I’m not giving him more publicity, he is just ABB. He acted out of hate. Like a bushfire he destroyed. But like a bushfire leaves fertilized soil where seeds grow into marvelous plants, his acts left us, his fellow citizens, with love fertilizing more love and good deeds. My workplace got shattered. My colleagues got wounded. 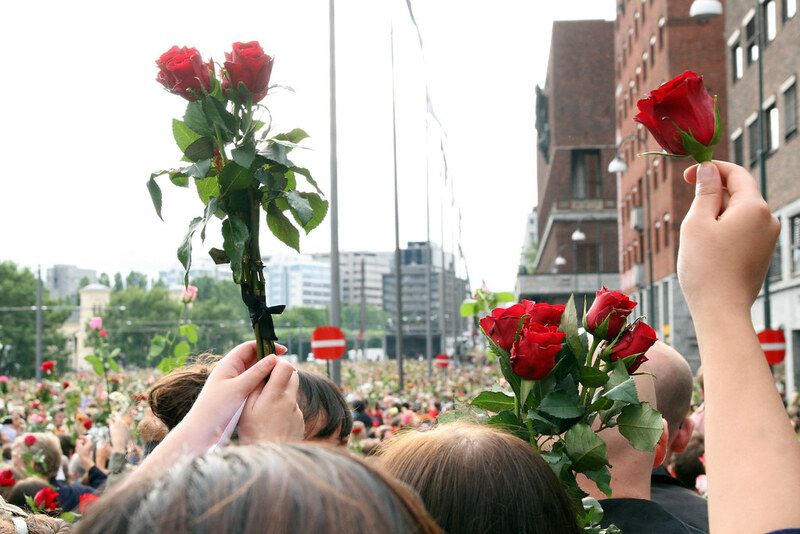 My heart got broken when I learned about the nightmare at Utøya. The following week I was sitting at my desk, looking Evil in the eye. I was in charge of the photos of the newspaper; I had to process his picture like every other photo. I had to read about his acts and thoughts, and his victims. I couldn’t gaze out the window for relief, as my window was gone. The explosion shattered the glass and a wooden board had been put in as a substitute. I started the day vacuuming my desk, keyboard and chair for tiny pieces of glass. I’m sitting on the subway, thinking of a boy in pre-school. His parents are from Sri Lanka. His mother doesn’t speak much Norwegian, but whenever I see her in the neighborhood or at the local gym, she’s eager to start a conversation. Last winter I think his father spent almost every afternoon teaching his son to ski, even though he doesn’t master it himself. I’m thinking of my daughter’s friend who asked her mother “How do you manage to teach me to ride my bike when you don’t bike yourself?” Her mother, a Muslim of Tanzania, is speaking Norwegian fluently after eight years in the country, and she sends her daughter to the catholic school St. Sunniva. I’m thinking of the mother of a classmate of my son. She looks and dresses like a model. She was wearing her Muslim head scarf, big earrings, a beautiful dress and high heeled sandals, and she was running around in the schoolyard playing ball with parents from all parts of the world with two things in common: living in Oslo and loving at least one of the kids they were playing with. That’s enough, that’s all it takes to be a society. I’m not saying that multiculturalism is without problems. Ethnic-Norwegian kids are being harassed for eating pork. Jewish kids are being bullied for … being Jews. Small girls are forced to wear hijab. Small boys think and act like they were in charge of their mother. I’m not saying this is not a problem. But today I want to put the great parents in the spotlight. Those who are eager to get to learn the Norwegian language; eager to learn about Norway, our way of life and our culture. Those who share their culture with us, who broaden our horizon, who improve our society. Those who want to be a positive part of our society. Those who manage the difficult balance of the new and the old culture, while living in Diaspora. This is a salute to you, to multiculturalism and to the love that colored our city with flowers. Thank you!